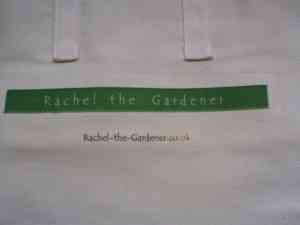 Rachel the Gardener: useful garden items for sale, including Soft String and lavender bags. Soft Strong: the kind way to tie up plants. Eco-bags: strong, re-usable calico bags for shopping. Lavender bags: the old-fashioned way to keep cupboards smelling nice. 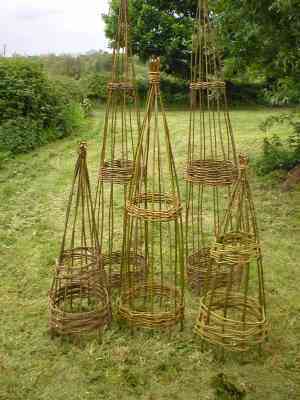 Plant supports: wigwams and/or obelisks, all made in locally sourced willow, harvested in true sustainable manner. I make a limited amount of these items each winter, and once they are gone, they are gone. Plant labels - three types: large chalk/white pen labels, discreet herb labels, or stylish gold and black labels for treasured plants. Soft string: This fabulous new product is not yet available in the shops or in garden centres: it is soft, and strong, and is better in every way than anything else I have used in the garden. 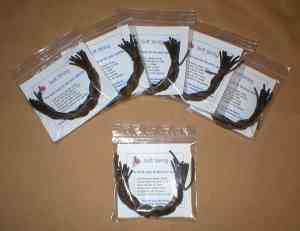 Comes in a handy pack of a dozen 7½" lengths. It is as strong as anything else I have used, but is much kinder, as it does not cut in to the stems. 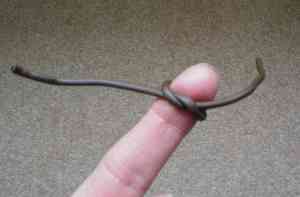 It does not go brittle in the way that plastic-coated wire ties do. It does not rot after a few months, the way that garden twine does. It doesn't hurt your hands when you use it - even on cold days! It is almost invisible, unlike pale white jute or that nasty bright green nylon string. It stretches, so it does not throttle a growing plant, or dig into the bark. It can even be undone and re-used! I can hear you saying "well, it must have some drawbacks?" and yes, it has two: firstly, it is made of plastic so if you are very keen to be eco-friendly, then it might not get full marks - however, you can use it again and again, so at least you are only buying it once rather than continually buying more rolls of string. And secondly, if you drop a handful of ties on the bare ground, they're difficult to find again!! I've been using this product for a couple of years now, and I am delighted with it. But don't take my word for it - splash out a couple of pounds, and try it for yourself! 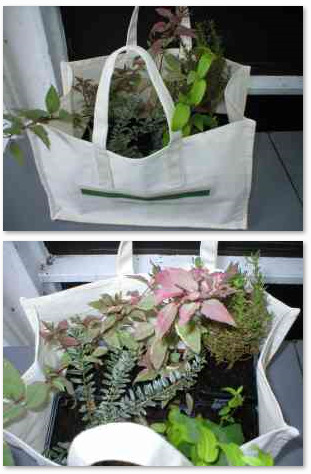 Ecobags: the ecologically sound alternative to carrying your plants home in a plastic carrier bag. Made from top quality 100% cotton calico, the Ecobags measure a foot wide (oh all right, 30cms) by 8" deep (er, 20cms) and 5½" across the gusset, that's about 14cms in new money. They are designed to be exactly the right size and proportion to carry six small or three large flower pots, with sturdy and comfortable handles. Being only half the height of a normal large carrier bag, the plants don't get crushed, and you can easily keep an eye on them during transport. And they're not only useful for plants - they are just as good for everyday shopping, and even for groceries, as you can get a surprising amount into them. In response to demand, I am now also making a slightly larger version, specifically for shopping: contact me for details. They are attractively printed with my logo, so that my customers can spot each other at a distance (excellent, free advertising!) but if you want a plain one that's ok, just let me know when ordering. Lavender Bags: fresh, plump, sun-dried, organically grown lavender, attractively packaged in golden organza fabric bags. Mmm, don't they sound just good enough to eat! I wouldn't recommend eating them, but you can't beat the old english fragrance of lavender to gently scent your drawers and wardrobes. Each bag contains a generous helping of organically-grown English lavender: no wadding, no stalks, just fresh, dried (if you see what I mean) flowers, picked when in full flower, and carefully filled by hand. 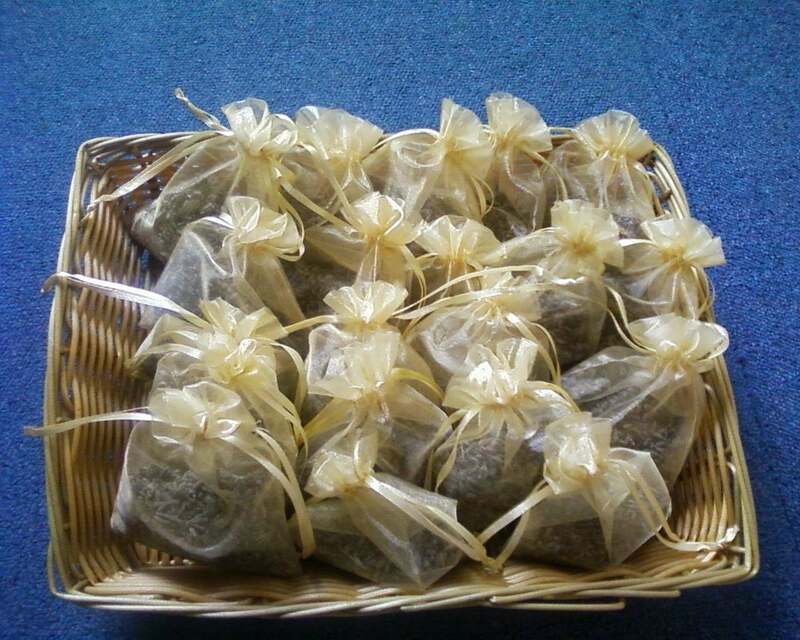 Each Lavender Bag is delivered in a sealed plastic bag, to maintain full freshness of the scent. Once opened, the fragrance will gently permeate the surroundings. Perfect for a gift, just as perfect for yourself. And if, after a year or more, the scent seems to be fading, just gently squeeze the bag a few times, to release the essential oils that contain the perfume. There! Good as new! Willow Plant Supports: instant height in a natural, locally-sourced material. In summer, ideal for supporting climbers such as clematis and sweet pea in the formal garden and, in the vegetable garden, runner beans. In winter, the framework is revealed, and is decorative in its own right. All are based on a circular wigwam shape: made from willow which will fade from fresh green to brown, and which should last at least five years. In windy locations, they can be pegged into the ground, or pushed directly into softish earth: but be warned, if they are very freshly-made, ie still very green, they may start sprouting! I make them in more-or-less three sizes, and they are all slightly different - this is a benefit of them not being mass-produced, but being made individually. They have been described as "slightly quirky" which I thought was quite nice. And yes, no nails are used, at all! Delivery is free in the Wantage area: £5 within a 15 mile radius, and elsewhere, well, I'm afraid that's not an option, but you are most welcome to come and collect them. If you wanted a particular size, or if you wanted a number of identical ones, that's not a problem, I can make them to order for you. Although when I say "identical"..... Just drop me an e-mail with your requirements and I'll confirm a price. I'd ask you to e-mail such enquiries, rather than phone, so that I can do the calculations and get back to you with firm details. Please note that I can only source material for making these wigwams once a year, and once it is used up, I can’t make any more until the following year. Plant Labels: several styles, all of which can be personalised. Curved for easy reading, ideal for use in the Vegetable Garden if used with chalk, which can be wiped off time after time: or great for marking a precious plant, if used with a permanent white pen. Delicate, discreet labels, ideal for herbs beds or herb planters, or for labelling newly-planted seeds. Available in packs of 12, ready-written, or plain, or - as a special service - if you don't like your own handwriting, send me a list of the names you want and I will hand-letter them for you. Please note, short names only!! 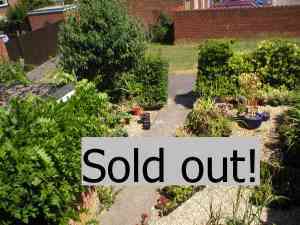 E-mail me at Inquiries@rachel-the-gardener.co.uk for details. Fun, weatherproof labels for herbs, comprising an embossed copper top on a short bamboo pef. Ideal for herbs, where they add a splash of colour and shine to the bed or the pot. Embossed weatherproof aluminium labels on 2' long wooden sticks: ideal for herbs, or for labelling precious individual plants. 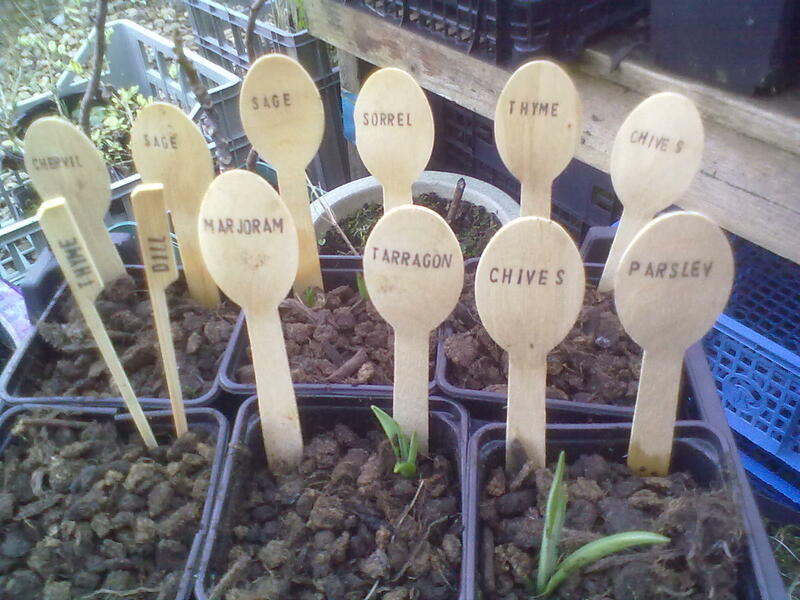 Simple, quirky birch wood spoons, printed with a selection of herb names. Choose from a standard set, or specify which names you want. 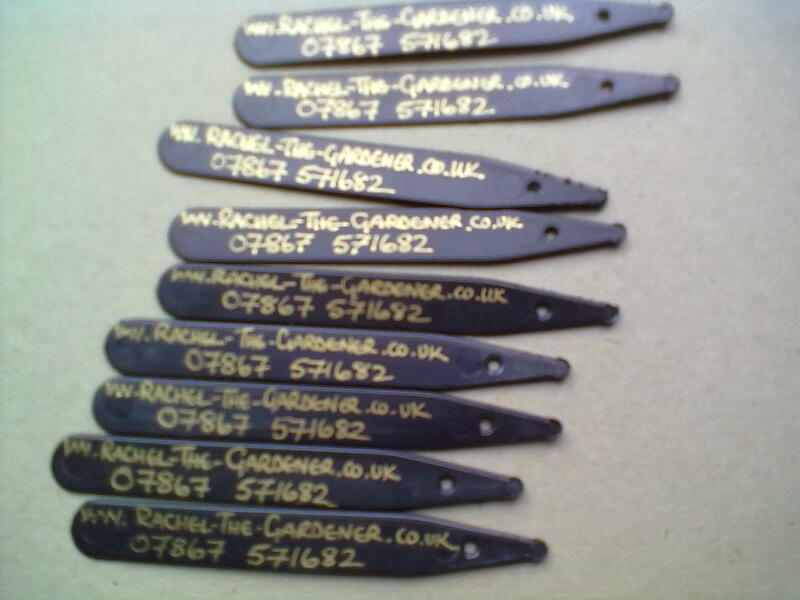 Special Black and Gold individual plant labels. Far too nice for the vegetable bed, use these labels to permanently mark special plants. Perfect for a gift for a garden-loving friend: e-mail me at Inquiries@rachel-the-gardener.co.uk with a list of the plant names required and I will carefully hand-letter them in gold, then post them to you.